California comes to mind first when we think of earthquakes, but Alaska, the Pacific Northwest, New York and much of the Midwest also run the risk of major quakes. The last time the New Madrid Fault running from Missouri to Illinois popped, the Mississippi River found a new channel and temporarily ran backwards. In California people often prepare for earthquakes; in the Midwest, people generally do not. 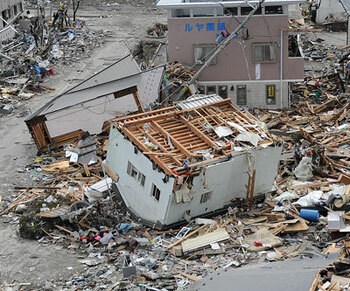 Much earthquake damage could be prevented by securing heavy items to strong parts of the building. Bookcases, water heaters, and other heavy fixtures should be bolted or strapped to the building frame. Once the quake hits, the current official advice is to find shelter where you are. Locate a safe spot in every room and practice getting into it. Crawl under the nearest sturdy piece of furniture or into the nearest doorway and hang on. When the ground stops shaking, if you've prepared an earthquake survival kit you're ready for the aftermath. After an earthquake, you need tools. Earthquakes break gas lines, electrical wiring, water pipes and sewer mains. All utilities should be shut down immediately, so you'll need wrenches to fit all the valves. The home survival kit should contain everything you need. If the earthquake hits while you're at work, reuniting with your family tops your to-do list for the day. A workplace emergency kit focuses on the essentials you'll need for that. Include cash, since credit cards won't be of use if the power goes out. A hard hat and walking shoes gives basic protection for a foot journey, and a day pack or fanny pack with essentials like rain jacket, food packets, a lighter or matches, water purification tablets and a bottle of water equips you for a reasonably long trip. Everyone should carry a serviceable pocket knife, but since most workplaces don't allow that today the other option is to keep one in the car. Store the kit on a shelf in your locker or in a desk drawer, untouched until you really need it. Cell networks might be overwhelmed with calls temporarily, but later on could put you in touch with faraway family members or emergency services. Re-charging cell phones would be a problem if you depend on grid power. Keeping a charger in your car for recharging the cell from the car battery works only as long as you stay with the car, but if you wind up on foot you'll need another way. Solar chargers only work when the sun is out and you need many hours of good sunlight to rebuild a charge. Crank generators are compact, lightweight, and just a few minutes of cranking powers up the cell for a short phone call, even in the dark. 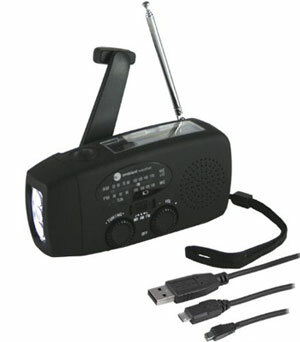 Consider a combination device like the Ambient Weather WR-088, a blend of AM-FM and NOAA radio, flashlight and crank cell phone charger and small enough to keep at the desk or workplace locker.